Back when I analyzed health plans and other benefits for a living, I asked a famous CEO what his goals were for the corporation's employee benefit plan. "I want to give them less and make them think it's more," he said. The new Republican budget proposes to radically restructure the country's relationship with its citizens. They're using bogus economics to confuse people into thinking these extreme cuts will somehow leave them more money. But they're really offering less -- much less. We'll deal with the politics later. The policy is astounding enough. But we'll throw in a little context: The top 25 hedge fund managers made a collective $22 billion last year. If they had been taxed under the same rules as cops, firefighters, nurses, and teachers, and if the president's proposed tax changes for the wealthiest earners had passed, these 25 people alone might reduced the Federal deficit by more than five billion dollars in a single year! But Rep. Ryan and his party prevented that from happening. "Party of deficit reduction"? Gosh, I don't think so. Since all the specifics aren't in, we ran some rough preliminary numbers. Here's what we found: Within ten years of this plan taking effect, most Americans would be spending all of their Social Security income just to pay for their health care or going without coverage. The Republicans claim their budget will cut $4 trillion from the Federal budget. But it will take much more than that out of everyone's pockets. 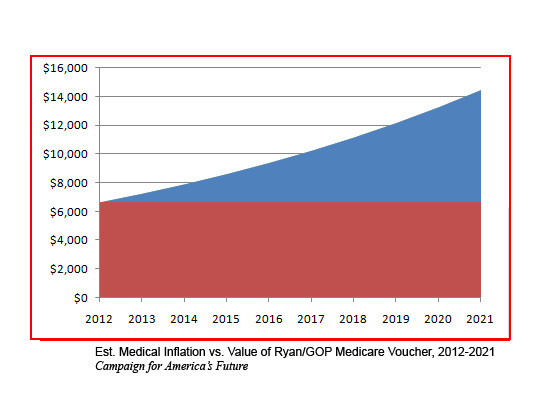 The Republican proposal wouldn't just end Medicare as we know it -- although it would certainly do that. It would also end Social Security as we know it. In the end America's seniors would pay more and get less as their social safety net was gradually eliminated. Their Social Security income would essentially evaporate as they were forced to spend it on previously-available health care coverage. That also means it would be redirected into the large corporations that dominate our health care system. The new budget is being presented by Rep. Paul Ryan, based on a proposal he co-wrote with economist (and long-time "entitlement" opponent) Alice Rivlin. It would dismantle Medicare and Medicaid starting in 2021, when Medicare's system of guaranteed, comprehensive health coverage would be replaced with "vouchers" under what's known as a "defined contribution plan" -- exactly what that CEO foisted upon his hapless employees. The "voucher" would be based on Medicare's 2012 cost per enrollee, increased by the general rate of inflation plus 1% every year. How would this change affect Medicare-eligible people? Seniors would either have to pony up the difference or get less medical coverage. But we're not going to restate all those out-of-pocket numbers again, because it's too depressing. Trust us: You wouldn't like them. The plan would raise the age when people become eligible for Medicare from 65 to 67, and would impose a means test on the program, so that anybody who makes $80,000 a year or more ($160,000 for couples) would have their Medicare benefit cut in half. By 2032, according to our estimates, that would be a penalty of nearly $9,000 under the more generous interpretation of the GOP plan. That presumably means that a "wealthy" recipient earning $81,000,would then be required to spend about $34,000 in medical premium costs if they want benefits at their current levels -- and that's out of a total after-tax income of $60,750 (if they're taxed at current rates). But since they've already been tagged as "wealthy," they're probably also going to see cuts in their Social Security benefits when those "triggers" go off, too. The plan also calls for much larger out-of-pocket costs for older Americans, too. 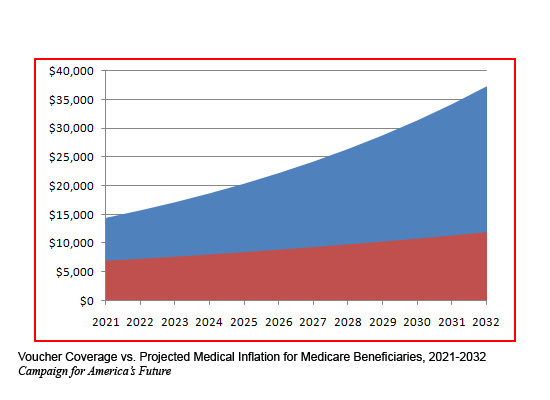 While some of this cost might be offset in the premiums -- unlikely, but theoretically possible -- that's likely to add another layer of cost onto already-struggling seniors. But since this is a blog post; and not a dissertation, we'll simply say for now that we agree with the Center for Budget and Policy Priorities, who said that "many sicker beneficiaries with incomes above 100 percent of the federal poverty line -- which is only $10,890 for an elderly person living alone -- would face higher costs and likely have less access to needed care." There are more problems, too. They claim their proposal adjusts for regional variations, but when an average Medicare recipient's care costs roughly twice as much in McAllen, Texas as it does in El Paso, how can a 'voucher' system adequately adjust for these costs? They're vague on specifics. Then there's the unpleasant reality that this plan abandons you to the tender mercies of private insurers, with no public recourse, alternative, or competitor. If history's any judge, these insurers will bounce you, resciss you, cut you, deny you, and generally aggravate you in all sorts of ways. Since health costs vary dramatically based on demographics, insurers are going to be "cherry-picking" healthier customers and trying to drive sicker ones away with terrible service and harrassive behavior. And since health care costs skyrocket during the last two years of life, you can bet that insurers will also be burning the midnight oil figuring out how to bounce people from their plans as they lay dying. Of course, most retirees won't be able to afford costs like these, so they'll go without needed medical care. There is compelling evidence that Medicare has significantly increased life expectancy and reduced the amount of time older Americans spend in the hospital. The public health benefits of Medicare will slowly be rolled back as fewer and fewer seniors get the health care they need. So while people may find it hyperbolic to say that "entitlement 'reform' is a euphemism for letting old people get sick and die," it's a verifiable statement backed up by hard numbers. And that's leaving out what may be the most important factor of all: Medicare and Medicaid practices (fee schedules, utlization review, etc.) have been one of the few forces slowing down our runaway medical costs at all. With those removed, our already explosive medical costs are likely to go through the roof. The impact of that could be so profound, so large, and so difficult to measure, that we haven't even tried. Medicare and Medicaid have been the only part of the U.S. health care "system" that resemble that of these other countries at all. The GOP plan would dismantle that and move our system in the opposite direction. What actually would solve our Medicare cost problem in this country? 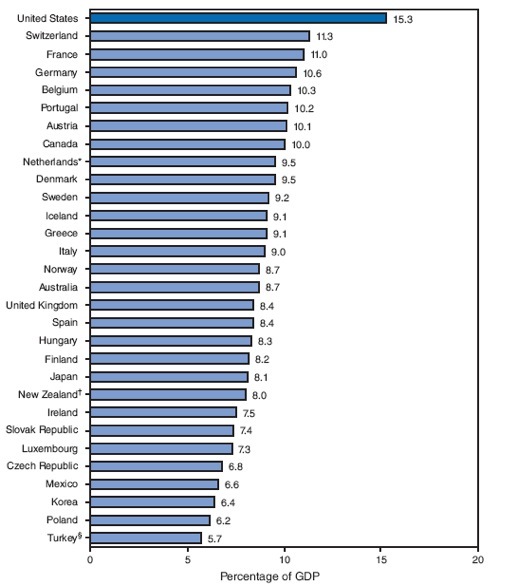 We pay 50% more in prescription drug costs than other industrialized countries. Our for-profit hospitals drive over-utilization of services. We add needless overhead to our health care expenditures. But changing those costs would require upsetting major corporate campaign contributors. Chronic and severe health conditions are the biggest drivers of medical cost, especially at the end of life. But a nation that shrieks about non-existent "death panels" will have a hard time reviewing and managing these costs in a meaningful way. And those hedge fund managers are doing just fine, thank you! Only the most willfully naive observers could convince themselves that the Republican Party, its corporate paymasters, or collaborators like Alice Rivlin, have any serious interest in reducing the national deficit. Their real motivation? Wealth transfer. As Rep. Eric Cantor said, "We're going to have to come to grips with the fact that these programs (Social Security and Medicare) cannot exist if we want America to be what we want America to be." This proposal is a huge step toward their vision of America. 1 - If we saw the same rates of inflation during this period that we saw in the first decade of the 21st century, medical inflation would average 9% while general inflation would average 4%. 3 - Overhead costs for non-governmental, nonprofit private-sector health plans are 16%, while for-profits are in the 26% range. Medicare's overhead is 4%. (To be fair, some of that overhead is marketing costs, which Medicare doesn't have. But these new plans will have marketing costs, along with everything else, including senior executive salaries.) Assuming that the for-profit/non-profit mix stays the same, private-sector overhead will average 21%, or 17% more than Medicare's current level. 4 - See, for example, Kassab et al. "The Influence of Insurance Status and Income on Health Care Use Among the Nonmetropolitan Elderly," Journal of Rural Health, 8 Apr 2008.